Hello! Today I’d like to show you something new, something fresh. Or at least this is how I personally perceive this project after seeing dozens of sites that convert youtube to mp3. This breath of fresh air I’m talking about is YTmp3.net. Please, do not mistake it for ytmp3.cc or ytmp3.com, – this one is waaaaaay better! As we all know, the biggest youtube mp3 converter youtube-mp3.org was shut down in September 2017. And so pretty much any site that deals with youtube-mp3 conversion has received a great boost of traffic, since millions of people needed new method to convert youtube to mp3. This month has also birthed dozens of imitators. There are quite a few of them, some don’t do nothing just display ads, others do convert video to mp3. But ytmp3 goes even deeper. Not only this site imitates the original design of youtube-mp3.org with its own twists and changes, it also claims to be the best imitator out there. Let’s take that statement to the test: is this site worthy? well, before you lose interest i will give you the answer: yes, this site is worth your attention!! As i’ve already mentioned, this site is way better than many other imitators of youtube-mp3.org or even many other established youtube-mp3 converters out there. Why? There are many reasons, and I will try to list some of them below. Yes, this is very new and amazingly simple. Ytmp3.net does not convert video into audio for you or do anything more with the than help your browser obtain audio data from the video. All is done client-side, aka your browser does all the conversion work. It’s true and quite revolutionary. So far the best we’ve seen was youtube to mp3 on the fly converters, such at theyoump3 and savetomp3. What they do is download audio from youtube and convert it on the fly, without saving it to their server, they just get some data, convert it, send it to you, and repeat this until all video is converted. 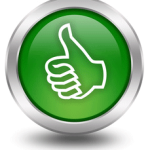 YTmp3.net goes one step further and instead of being the middleman in the conversion process, it gives you the seamless tools to exclude the middleman and do the work yourself. And of course you don’t really do nothing, do not be scared, you just slide the big blue circle and all work is done by your browser. I have had my reservations at first about this process and decided to compare how the video from the tutorial below will convert on my 8 core AMD desktop with 16GB ram and my smartphone Samsung Galaxy s7. I thought that doing this conversion on my phone will be a long long process. Well, i was wrong. Desktop converted the 4 minute video in 30 seconds, while smartphone needed only 30% more time and completed the job in 40 seconds. Very good result, actually. 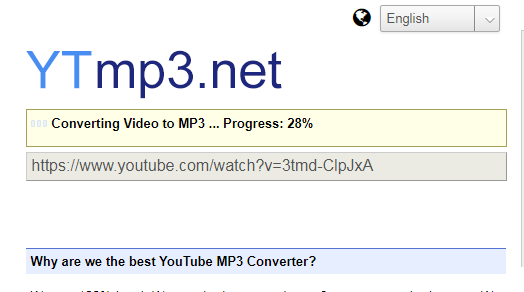 another thing i just had to check and was quite pleased: ytmp3.net doesn’t make you download video and convert it, no. It actually finds best audio track that youtube provides for that video, and then has your browser download that track and convert it to mp3. This way you do not download a 40mb video and convert it to 4mb mp3, no, you only download the 4mb audio (aac or webm), and then convert that to mp3. kudos on that! saves on mobile data too. i mean, it doesn’t technically save on mobile data, but it doesn’t make you download extra large file to convert it to a smaller sized file.. The audio is download directly from youtube, so you get the fastest possible download speed. period. No matter how busy and crowded ytmp3.net may get, audio is always downloaded at high speed. 5. No ads… Maybe just for now.. But still: NO ADS!! the title says it all.. No ads means you don’t need to worry about any popups and nasty audio in your speakers about some stupid new cleaning supply or some shabby casino or whatnot… Enjoy no ads while it lasts. Maybe when this site hits Big Traffic, ads will be added, but for now.. Cool! As you all know, I do not hold back when reviewing sites in my niche… And despite many positive things listed above, i do see a number of negative-impact traits that I want to mention further down. Offered quality conversion drop down has audio option up to 320kbps. While the best youtube offers is barely over 128kbps. I do understand why this is done, to boast that ytmp3.net does HQ audio conversion, but in the end this doesn’t mean anything. really… You still download that 140kbps audio from youtube, so no extra data is transferred, and your browser makes that data not 140kbps, but 320kbps, 2.5 times the size it really needs… Anyways, people, do not expect great audio quality from youtube. it’s just not possible. User interface. On the images below you may see these little quirks that i would definitely try to change. I think they make UI a bit non-intuitive.. For example, when you first enter the site, the box where you put the video URL already has a video URL… This of course makes you think that you need to slide the big blue button before placing the URL into the box. And since default URL is already there, browser begins the conversion process on a video you don’t care about… I have lots of experience with youtube-mp3 converter sites and I honestly converted the ‘default’ video twice before I really finally got to convert my video… A nice solution to this would be having the video URL box empty with a placeholder, and enabling the blue round slide-button (slide to agree and convert) when user actually enters their video URL into the box. this time we’ll try to download and convert Look what you made me do by Taylor Swift. it’s a 4 minute song, we should be good… Below are the 4 steps and screenshots i’ve taken of the conversion process. this is how it looks like right now. Note the video URL box is already populated with the ‘default’ video that confused me… There you can also change site’s language in best traditions of youtube-mp3.org, as well as conversion Quality. You can also drag-n-drop that black button on the right into your bookmarks and then click on it when you’re on a youtube video page to quickly call up on ytmp3.net and start youtube-mp3 conversion in no time. Please note the blue circle I’ve marked with my red arrow. When you are ready and have entered your video into the box instead of the default one, slide or drag that blue circle to the right to start the conversion. Now all you need is wait a little bit. 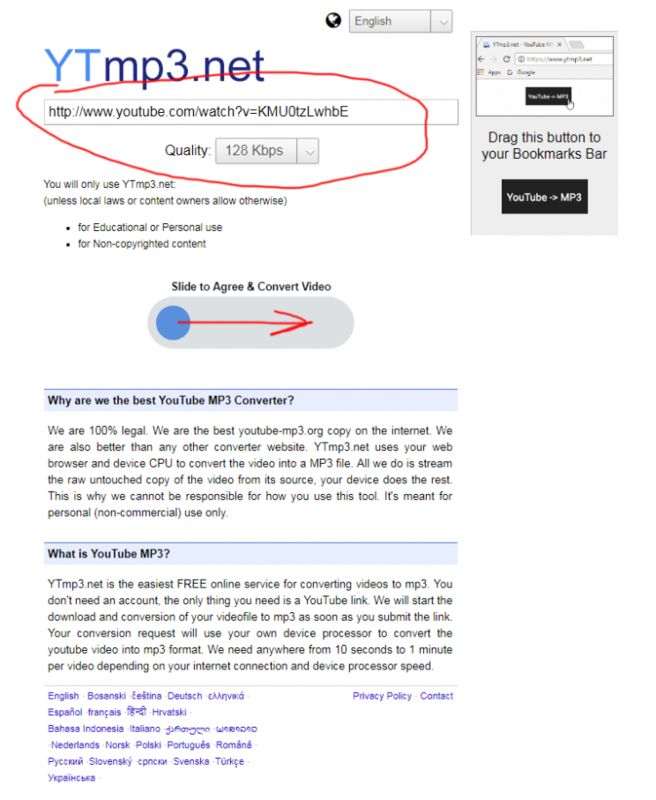 Depending on your device speed, free RAM, and browser’s allocated resources, 1 minute of video can be converted in as low as 5-10 seconds..
ytmp3.net has shown itself as a solid resource to convert youtube to mp3. The conversion process is somewhat revolutionary and happens client side, so your browser does all the conversion work. While tools for that conversion are downloaded from ytmp3.net server and occupy quite a bit room in browser cache, they do the right job and work quite fast, both on desktop and smartphone. Editor’s rating 5 of 5. Good job! !